"Here, we have been engulfed by the most devastating epidemic. No matter how much the children play, there will never be laughter. There is no mother or father here who can pay his son's or his daughter's school fees. The multitude of children here are destitute. They work on the streets because that is the only way they can survive. Simple is the language of the poor, the language of the destitute, the language of the dying man. If you do not understand this now, you never will"
Although the Ebola crisis is almost over from a health perspective, the social and economic consequences will be felt for years to come. Fear of contracting the disease, along with harsh quarantines and restrictions on movement, has led to the widespread failure of harvests, the deaths of livestock, the collapse of small businesses, and the closure of marketplaces. Almost 10,000 people across the region have died from Ebola, but thousands more are at risk of starvation and worsening poverty; and most at risk are the children. We know from our work in these countries that there are at least another 20,000 destitute Ebola orphans still on the streets of Liberia and Sierra Leone, at risk of hunger, malnutrition, and abuse; and right now, without anyone to care for them, their access to education is critically at risk as a direct result of the disease. As the world moves on from thinking about people like Heixim, and the orphaned children around him, the crisis is, for them, only just beginning. As a global federation, Street Child is running a Legacy of Hope fundraising appeal. We are aiming to raise a minimum of $1,500,000 over the next few months to assist these 20,000 into a caring family environment, and back into school, before it is too late. Please help us turn the legacy of Ebola into one of hope, not hell. 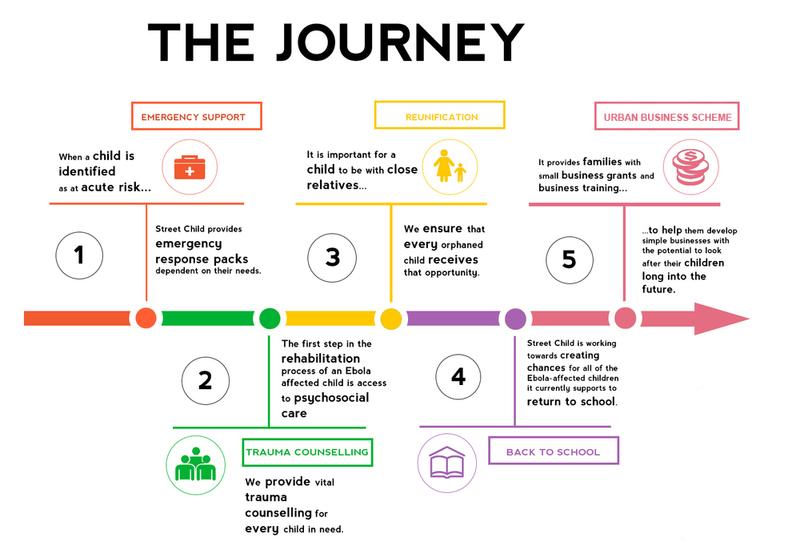 To find out more about Ebola, the consequences of the catastrophe, and the orphans whom your donations support, take a look at our Ebola FAQs, or read our Ebola orphan report for Sierra Leone. Thanks to your support, Street Child has been able to help literally thousands of children. The scale of the problem is vast. Find out how your gifts could help thousands more orphans.